Caution: The video contains graphic images. Daniel Jimeno Romero, 27, of Alcala de Henares (near Madrid) was gored in today’s Running of the Bulls in Pamplona, Spain. According to eye-witness accounts, Mr. Jimeno Romero was moving backwards, facing an oncoming bull named Cappuccino. This rogue bull had been separated from the herd. Daniel Jimeno Romero then tripped over some other runners, and he falls to the ground. While trying to retreat feet-first under the wooden fence, the bull gored him in the neck. The puncture extended to his lung, and the bleeding was immediately profuse. It’s the first death at the event since 1995, when 22-year-old American Matthew Tassio was gored to death during the running of the bulls. 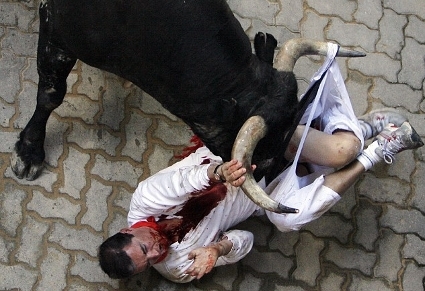 Also, in 2003 Fermin Etxeberri, a 63-year-old Spaniard, was trampled by a bull during the running of the bulls. He was actually trampled in the head, and then he died later that year after spending months in a coma. Since they began keeping records in 1924, there have been 15 deaths at the Running of the Bulls during the san Fermin Festival in Pamplona, Spain. My thoughts and prayers go out to Daniel Jimeno Romero, his friends and family.